Plexaderm is a skin serum formula that may assist in making your skin firmer and help to tighten wrinkles, fine lines, and puffiness under eyes. The product is advertised as a rapid wrinkle remover, and it claims to deliver immediate effects in combating skin aging and improving your overall appearance. According to Plexaderm reviews, the product is suitable for adults of all ages who have noticed wrinkles or under-eye bags appearing. The serum can be used by both sexes and people of all skin types and tones. As for Plexaderm benefits, the manufacturer has a quite long list of claims for the product, but everything comes down to improving your skin appearance and making you look younger. The first in the line of alleged benefits is that the formula may reduce the visibility of under-eye puffiness. It is a common occurrence when you are tired, but it can also be an aging sign. If you notice the bags under your eyes, this product might help to tighten them and reduce their visibility. The same goes for dark circles that often show below your eyes, but also dark spots you may encounter on other areas of your face. 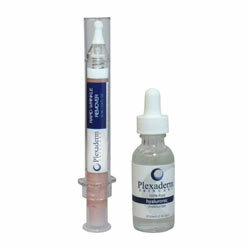 Whether you are dealing with dark spots, acne, or another imperfection, Plexaderm might be helpful. The product works by creating a new skin layer that may decrease their visibility and improve overall skin appearance. The product might assist in dealing with wrinkles and fine lines on various areas of your face, which includes forehead lines, crow’s feet, and other imperfections. The components may assist in decreasing the depth of fine lines that occurred as a consequence of skin aging. The formula is quick-acting, and it should help to tighten your skin in less than ten minutes. However, it is vital to mention that the results largely vary from one user to another. The company claims this solution provides a simpler alternative to Botox or surgery as it delivers short-term effects that might make your skin look plumper and smoother. It is, however, important to keep in mind that Plexaderm focuses on short-term effectiveness. It may deliver results almost instantly, although the effectiveness depends on the user. However, the results won’t last for more than several hours, which means the formula doesn’t deliver any long-term benefits. It is vital to note that these products won’t boost the short-term effectiveness of the default Plexaderm formula. The moisturizer and nighttime serum might help to fight aging signs in the long run and prevent or delay the appearance of wrinkles and fine lines. Who Is the Manufacturer of Plexaderm? According to our Plexaderm reviews, the company behind this product is Sheer Science. The information on their official website suggests that their headquarters are in Farmingdale, New York. If you have any questions about their product, you can contact them by sending an e-mail or calling customer support. They also have a dedicated phone line for those who want to place orders. Sheer Science claims that their team is focused on delivering actual results to their customers. Their objective is to create innovative formulas that can take product effectiveness to the next level. Customers are their primary concern, and they strive to provide optimal buying experience and a straightforward ordering process. Apart from Plexaderm, the company manufactures several other products. One of them is Dekliderm, which is advertised as a self-adjusting foundation for your skin. If you have problems with hair thickness, you may boost its volume with Kerafy. The company also designed Power Swabs, which aim to whiten your teeth effectively. When you check out the reviews talking about the working process of Plexaderm, the crucial thing they mention is that this is a transdermal cream. In layman’s terms, you apply it directly to your skin, and it starts working from there. The ingredients penetrate the layers of your skin, as well as form another tightening layer to deliver the alleged benefits of the product. As for the claims, the primary one is that it may improve the look of your under-eye bags. The reason why these bags appear in the first place is that our skin and tissue weaken. That is particularly noticeable below our eyes because the fat they hold moves forward and causes these bags to show. As a result, you may look like you are tired all the time even though you are not. Plexaderm has ingredients that might work together to deal with these unsightly forms around your eyes. The silicate minerals included in the formula, such as sodium silicate and magnesium aluminum silicate, are derived from shale clay. They can develop an extra tightening layer in minutes, and it is this layer that might help to tighten your skin. Apart from tightening under-eye bags, it may also iron out wrinkles and fine lines, but the effect will only be temporary. Here is how the process works – sodium silicate is in charge of “pulling out” and tightening the under-eye bag and the wrinkle. It is then when magnesium aluminum silicate tries to fill in the imperfection to ensure it looks even and plump. That is how the product claims to act to make your skin younger and plumper overall, but as we mentioned, these effects only last for several hours. Our medical review has established that the results of the serum are not permanent. That is what the manufacturer emphasizes, too. The goal of Plexaderm is to be a quick-acting formula, and it may be successful at that. It doesn’t take more than ten minutes for the product to deliver effects for most users, but its effectiveness depends only on your skin. Many users need to apply the serum one more time to potentially notice any effects of this cream. Any results you get will last only for several hours. While a couple of ingredients, such as collagen and hydrolyzed rice protein, may be beneficial for your skin in the long run, the tightened skin will wear off as soon as you wash your face. The manufacturer emphasizes that the product can hold its effectiveness for up to eight hours. The good news is that you can apply the serum whenever you feel that is necessary. Plexaderm Ingredients – Are They Safe & Effective? Soluble Collagen – It is an essential protein for skin, joint and muscle health. Our body produces collagen, but the production decreases over time, which is why we need the additional amount of this compound. That is what can lead to wrinkles and other skin imperfections. Adding collagen to your skincare regimen can be essential to deal with fine lines in the long run and make your skin young again. Sodium Silicate – Our Plexaderm wrinkle reviews confirmed that this is another crucial component of the formula. The scientists indicate sodium silicate is an inorganic salt that can help to control the pH of skincare items. They also prevent corrosion and can help to tighten the skin temporarily. Acetyl Hexapeptide-8 – It is a powerful peptide also known as Argireline. It is an often addition to skincare items as it can be effective in dealing with wrinkles and fine lines. Muscle contractions are what causes wrinkles in the first place, but this compound helps to prevent these contractions temporarily. It does that by intercepting the signals from your brain, which is how it manages to make your skin look young. Magnesium Aluminum Silicate – It is a complex silicate that many products use to improve viscosity. As for this formula, it is vital that it acts as a thickener and assists in absorbing excess facial oil, which is how it improves overall skin appearance. You might know this compound as purified clay. Cellulose Gum – Here is another component that has the goal of thickening your skin and creating a film on it. It is what significantly contributes to the product’s immediate effectiveness and improves your facial skin appearance. The other ingredients are ethylhexylglycerin, Phenoxyethanol, titanium dioxide, xanthan gum, hydrolyzed rice protein, propylene glycol, purified water, CI77492, and CI77491. What Are the Advantages of Plexaderm? It may act quickly – The product is advertised as a rapid-acting formula, so you might not have to wait for hours to see it working. Instead, the manufacturer claims you may notice results in about ten minutes. It can help in dealing with under-eye bags – The product forms a tightening layer on your skin, which might make it look smoother and younger. Thanks to that, the formula may temporarily reduce or eliminate under-eye bags. It might tighten and iron out wrinkles and other imperfections – The ingredients may work together to make your skin look better overall, and that includes improving the look of your wrinkles, fine lines, and any other noticeable imperfections on your face. The formula may be suitable for all skin types and tones – The manufacturer claims everyone can use the product regardless of the tone and type of their skin. It is relatively easy to apply – When it comes to cosmetic formulas, Plexaderm is not the trickiest one to apply. Our wrinkle reviews indicate that applying it doesn’t take a lot of time. A 30-day satisfaction guarantee – The manufacturer seems to be so certain in the quality of its product that it offers a 30-day money back guarantee. In case you are not satisfied, return the product and get a refund. What Are the Disadvantages of Plexaderm? It doesn’t deliver long-term results – Even the manufacturer emphasizes that the product will wear off after several hours. Irritation is possible – the product contains some ingredients that may irritate sensitive skin, which is why you may need to do patch testing before you the cream. You might need to apply the serum two times – You might not notice any effects from applying the product the first time. Applying it the second time might boost the chances a little, but whether the product will be effective ultimately depends on your skin. A single bottle might not last for an entire month – It depends on how often you use the product, but it seems that the quantity per bottle is quite modest. It shouldn’t be used at the same time as the moisturizer – Even the moisturizing formula developed by the same manufacturer can compromise the product’s effectiveness. How Should You Take Plexaderm? Step 1. Start by washing your skin and patting it dry. Step 2. Notice the pump on the bottle. Use it to dispense the product onto your fingertip. You do not need more than a half pea size to begin. Step 3. Use your fingertip to distribute the serum to desired areas evenly. You can apply it under your eyes, but also other sections of your face where you notice wrinkles, fine lines, and other imperfections. Make sure to be gentle and avoid the product getting in touch with your eyes. Step 4. Give the serum around 10 minutes to see if you notice any results. If it is your first time using Plexaderm, you may need a bit of patience to get the pump to work. Try pressing it for 10 or more times until you notice that the serum is ready to flow. Plexaderm reviews indicate that the effects may last for up to eight hours. You can apply serum as needed, but some users see results only when they use the serum for the second time approximately 5-10 minutes after the initial use. While you can apply the product as needed, the website indicates that you shouldn’t use a moisturizer after the serum as it may affect its results. In case you notice that you applied too much serum, get a clean damp cloth and tap gently to eliminate any excess product. You will notice that you have more cream that needed if a white film appears on your skin. Although the formula claims to have rapid effectiveness, you can try to accelerate the process of drying by using a blow dryer. However, remember to keep the settings to the lowest available temperature. When it comes to tips for storing Plexaderm, there aren’t any particular rules to stick to, which means that you can store it at room temperature. However, you should ensure to put the cap on the product between uses. One bottle for $59.95 – A single pack of the product, including free processing and shipping. Three bottles for $119.90 – It is a 2+1 deal, which means you will get the third pack for free. If you go with this order, the supplies may last up to three months. Each bottle should contain 5mL (0.17 FL OZ) of the product. According to Plexaderm reviews, a single pack should last you for 30 days as long as you apply the product to both eyes once every day. The manufacturer emphasizes that all orders are one-time purchases and there is no automatic shipment involved. You can find the product online, but if you want to ensure that you will get the original formula, we would suggest the official website. The product has its site where you can place orders, and if you prefer an alternative, you may look at big e-stores. However, always try to ensure you are buying from an authorized seller. The manufacturer claims that the product doesn’t have any significant side effects. However, it is a formula that has some alcohol-based and other ingredients that may cause skin irritation. Additionally, it is only normal that adding a new skincare product to your regimen might lead to an allergic reaction. If you have sensitive skin or want to be on the safe side, it may be wise to do a patch test before you use the product. Skin irritation may not be actually harmful to your skin, but it can harm your appearance short-term and be an annoyance. What Is Plexaderm’s Return Policy? An important thing to keep in mind is that the manufacturer offers a money-back guarantee that lasts for 30 days. In other words, instead of reading wrinkle reviews written online, you can try Plexaderm and remain risk-free. It is vital to note that the guarantee covers the first month’s supply of the product and is valid for 30 days from the date of receiving the serum. Customers are allowed to return both opened and unopened bottles within that date. However, if you do not return the goods within the specified timeframe, the guarantee will expire, and you won’t be subjected to a refund anymore. In case the company accepts a refund, they will issue funds back to your account within ten days. It is crucial to mention that the refund will be reduced for the price of processing and shipping. Does Plexaderm Offer a Free Trial? At this moment, it doesn’t seem that there is an offer that involves a free trial of Plexaderm. However, there is the money-back guarantee you can use to test the product for a limited time. In case you are not satisfied, you can expect a refund of the product price from the manufacturer. Is There Anything Else I Can Do to Eliminate Puffy Eyes? Make sure to get a good night sleep and try to achieve an optimal sleeping routine. Try applying cold items, such as ice cubes or chilled cucumbers and tea bags. Keep them for about 15-20 minutes on each eye. Buy an eye cream that includes antioxidants, and helpful de-puffing compounds like green tea extract or caffeine. Plexaderm seems to offer a formula that tries to deliver short-term effects that might improve your skin appearance. The results experienced from this cosmetic product largely vary from one user to another, but the manufacturer claims you can see the effects five to ten minutes after applying the cream. You might notice that your skin looks younger and plumper, but keep in mind that the effects only last for several hours. As soon as you wash off the serum, they will go away. When it comes to long-term benefits, they seem to be minimal or non-existent. Plexaderm looks like a product that may focus on trying to help you achieve a temporary younger look when you feel that is necessary. It might tighten under-eye bags, and help in reducing the visibility of wrinkles and fine lines. However, some users claim that they need to apply the product two times to see any difference, and even in that case, the results might largely vary and not last for long. The ultimate result of our wrinkle remover review is that you should decide whether you should try Plexaderm. You may consider it if you want to look good for a big event and you need a short-term formula to assist in improving your skin appearance. However, the actual long-term benefits in combating skin aging do not seem to be present with this product, and the results it delivers largely vary. I wish I could give this more than one star, but I can’t. It did not work for me at all. At the very least, I hoped it would help moisturize the skin around my eyes, but it didn’t even do that. My skin was just as dry, if not drier, than before I used it. Maybe it works for other people, but it has done nothing for me. I was looking for a product that is professional strength to help with the fine lines and wrinkles around my eyes and forehead. Plexaderm seemed like a good choice based on the reviews I read. I’m glad I gave it a try, because after a month of use, I’m starting to see results. My fine lines and wrinkles are definitely improving. Now I feel more confident about my face. Being a 56 year old lady, I no longer have that glow I used to have when I was younger. Wrinkles are beginning to form around my eyes and I was not comfortable with it. So, I tried different skin care options, especially eye cream products, but most of the options I could get my hands on did not give me the results I desired. Some would work for a while but leave spots and itches on my face. Others would keep my face dehydrated and irritated all day. I almost gave up totally before I decided to give Plexaderm a try. Plexaderm has been amazing. My wrinkles have reduced to the barest minimum and I now look and feel younger. My face is more hydrated and I feel more confident when I step out. Plexaderm has worked for me, you should give it a try too. I’m 32 and I wanted my crow’s feet to go away, so I started looking for a product that might work on them as soon as I started to see them appear. I’ve had five children now and I guess I’m aging faster than some of my friends! I don’t get a lot of sleep and I’m also sick of the dark under eye circles. I started using Plexaderm a month ago and I’ve seen little to no improvement since then. I will continue to use it, but I am concerned it’s a waste of money. I guess I knew I would not find the fountain of youth with Plexaderm, but I was hopeful. I have had crow’s feet for quite some time. I also get a lot of under eye puffiness and circles. At the very least, I thought this cream could help the puffiness and dark circles go away. Unfortunately, I was wrong. Except for offering a little bit of moisturization, Plexaderm isn’t doing anything for the skin around my eyes. I don’t think I will be buying more. Before I even go further, I must say that the container is awful. I pumped for ages to get the product to come out. Is that how people use this product? I didn’t want to feel like I was in a gym session every time I pumped out the product! Anyway, I tried it…OMG! It’s terrible. The product did not produce any results after using it for weeks. I hate the fact that I underwent all that. I don’t recommend Plexaderm to anyone. I wish I had someone to tell me that this product is a waste of resources and time.